Every month a diverse group of Christian bloggers discusses a book over email. This month we discussed Daisy Chain by Mary DeMuth. 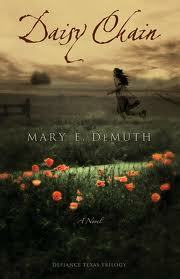 About the Book:The abrupt disappearance of young Daisy Chance haunts the small town of Defiance, Texas. Fourteen-year-old Jed Pepper searches for answers in this gritty and compelling story of love and sorrow, revealing God's hand of redemption in impossible situations.